Sen. Chris Murphy has co-sponsored a bill to expand background checks. 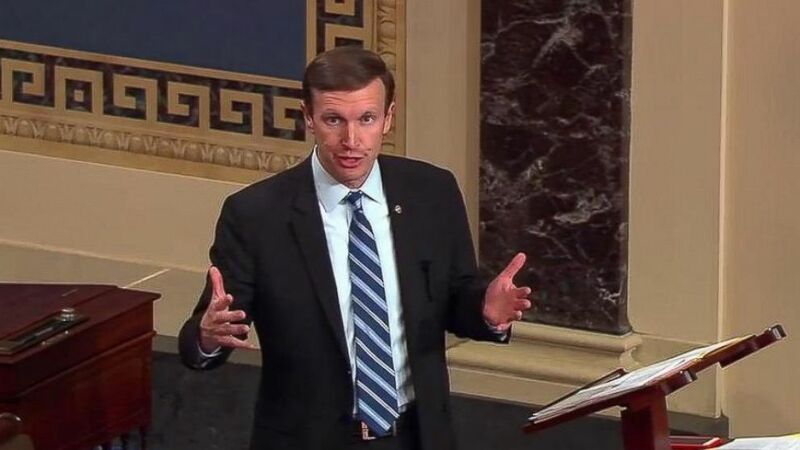 camera (ABC News) Connecticut Sen. Chris Murphy said he would remain on the Senate floor "until we get some signal, some sign that we can come together," and evoked the Newtown school shooting in his state in 2012. The senator behind the 15-hour gun control "filibuster" this week in the wake of the Orlando shooting is already looking beyond Monday's scheduled vote on a series of gun control amendments that are expected to fail. Sen. Chris Murphy, D-Connecticut, said a measure he co-sponsored to expand background checks, along with a proposal from Sen. Dianne Feinstein, D-California, to prevent anyone on the terror watch list and no-fly list from buying a firearms, will face resistance from Republicans. The Senate is also set to vote Monday evening on a pair of Republican amendments from Sen. Chuck Grassley, R-Iowa, and Sen. John Cornyn, R-Texas, that would implement a three-day waiting period on gun purchases to give law enforcement officials time block a sale in court. All four measures -- the two sponsored by Democrats and the two sponsored by Republicans -- are expected to fail. But Murphy said he is encouraged by work going into more limited compromise proposals from Sens. Bill Nelson, D-Florida, and Susan Collins, R-Maine. Nelson's measure would alert the FBI when someone suspected or previously investigated for terror ties tries to buy a firearm. Collins’ proposal would block gun sales to terrorism suspects on the no-fly list or a similar list of individuals who require additional airport screening – a list that Orlando gunman Orlando Mateen was on, according to Collins’ office. The FBI would also be notified if someone who had been on either list in the previous five years buys a gun. The Maine senator’s measure would also allow individuals to appeal decisions preventing them from buying firearms and would award attorney fees. “None of this would've been happening if we hadn't gone to the floor and forced this discussion,” he said. After Monday's vote, he added, the Senate will be on the record ahead of Election Day in November. “Republicans are interested in compromising because they know on Monday night a lot of them are going to have to take a really bad vote,” Murphy argued. The Connecticut Democrat said he won’t be discouraged if the amendments fail next week. “I represent Sandy Hook [Elementary School]. I just dropped off my 7-year-old for his last day of first grade today. I have a personal obligation to those families and to my family to do everything within my power to try to make this country safer, even if along the way I don't win every single vote,” he said.